Zaino Z-5 PRO represents the summit of modern paint care and protection technology, and boasts more shine, more gloss, more depth, more clarity, greater reflectivity, and improved swirl-hiding properties. Z-5 PRO is the perfect choice for detailing enthusiasts, amateurs, and professionals alike. Thanks to its advanced, non-abrasive, micro-filler polymer technology, Z-5 PRO fills and hides minor surface imperfections even better than before - owners of dark cars (black, blue, green, red) will take delight in knowing that with just a few simple applications, swirl marks, spider webbing, and other surface headaches will become nothing more than a distant memory. Speaking of memories, forget about spending hours and hours each weekend trying to perfect your vehicle's finish - Z-5 PRO is easy to use. There simply isn't a product that's easier and more effective to use than Z-5 PRO Show Car Polish. Zaino Beta testers report being able to polish an entire car to perfection in less than 30 minutes with Z-5 PRO and our revolutionary ZFX catalyst. Best of all, Z-5 PRO's mile-deep, crystal clear, mirror-like results will last and last, thanks to the most advanced polymer protectants available. Expect months of durability from Z-5 PRO, rather than weeks of quickly fading protection like those of our competitors. Zaino's paint care systems have revolutionized the industry and set the bar for perfection to an all-time high - Z-5 PRO creates a finish that's simply unlike anything you've ever seen before, with unmatched durability, and unbeatable optical qualities. And like all Zaino Show Car Polish protectants, you can layer Z-5 PRO for even greater results. Because Z-5 PRO contains no abrasives, it can be successfully layered, unlike other products that contain cleaners and cheap oils. Layering improves the uniformity of the surface, hides and fills imperfections even better, and will improve the gloss, depth, shine, and "wetness" of your vehicle's paint with each subsequent application. Z-5 PRO also contains Zaino's proprietary, state-of-the-art Ultra-Gard UV-40 sunscreen protection to ensure that your vehicle's finish stays looking as brilliant and vibrant as the day it left the showroom. So if you're looking to take your vehicle to "the next level," look no further than Zaino Z-5 PRO Show Car Polish. For the deepest black, the most brilliant blue, or the most captivating red, there is no alternative - Zaino Z-5 PRO will deliver stunning results that'll turn heads, drop jaws, and solicit envious looks no matter where you go or what you drive. It's that good. Evaluate the surface of your vehicle. If swirl marks and other defects are moderate or severe, take time to prepare your surface with an appropriate swirl mark remover. Layer Z-5™ PRO Show Car Polish as necessary to hide minor swirl marks, defects or spider webbing. For maximum gloss, follow Z-5™ PRO Show Car Polish with one or more coats of Z-2™ PRO Show Car Polish. Z-2 will provide an even higher gloss finish than Z-5. Always use Z-6 Gloss Enhancer Spray or Z-8 Grand Finale Spray Seal between each and every coat of Z-5 and Z-2. Maintain with Z-7™ Show Car Wash and Z-6™ Quick Detailer or Z-8 Grand Finale Spray Seal as necessary. It is best to avoid the use of abrasive products as much as possible. However, with deeper swirls and fine scratches, sometimes they are necessary. If you don't see a visible difference after 1 to 3 coats of Z-5 PRO, you need to use Z-PC™ Fusion Dual Action Paint Cleaner Swirl Remover . Z-5™ PRO Show Car Polish is very easy to use. There's no need to rub hard or use a machine. Thoroughly wash your car. For best results, it is critical to enable Z-5™ PRO Show Car Polish with ZFX™ Flash Cure Accelerator Additive. 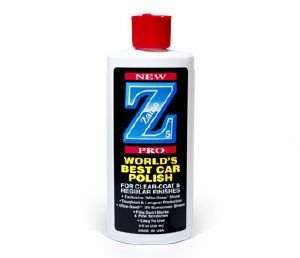 Apply a thin coat of Z-5 PRO to your entire car using a 100% cotton cloth or applicator pad. On top panels, use front-to-back hand motions. On side panels, use up-and-down hand motions. This helps improve reflectivity. Heavy rubbing is not necessary. Use a clean, microfibre buffing towel to buff off Z-5 and reveal the hidden beauty of your paint. As you become more familiar with Z-5™ PRO Show Car Polish application, one eight ounce bottle will do a car 20 times. The key is even and thin layers.